Today is day 15 of my #100dayproject, where I am preparing and sharing 100 salads for 100 consecutive days. My friend, Astrid, Founder and CEO of Twindly.com, urged me to take on the 100 day project, which she was a part of last year. For her project this year she is asking 100 people to share what makes them feel beautiful as well as three of their favorite beauty products. Check out Astrid’s project on Twindly’s Instagram. It seemed only fitting that I would eventually prepare Astrid a salad lunch considering that she convinced me to take on the project in the first place. She came to visit me today, laptop in tow, so that we could co-work with one another. 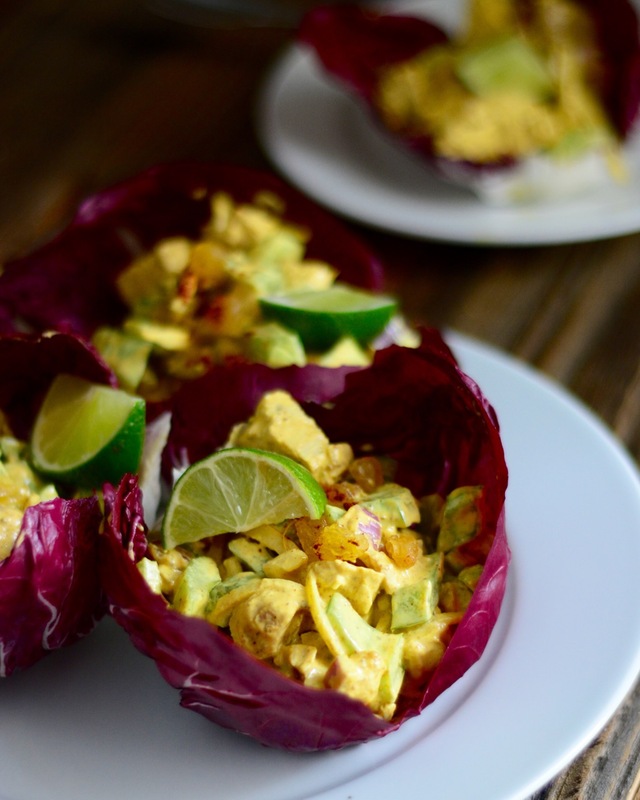 For lunch I cranked out these Curried Chicken Salad in Radicchio Cups for us. 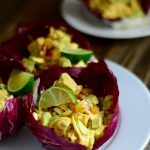 The radicchio in not only beautiful to look at against the golden curried salad, it also functions as the edible vessel for all that wonderful chicken. I think it was a hit! Start by heating 1 tablespoon of olive oil in sauté pan over medium-high heat. While you wait for the pan to heat, season the chicken breasts with sea salt, pepper and 2 tablespoons of olive oil. Massage the chicken breasts with the seasoned olive oil to ensure that the flesh is well seasoned. Once the oil in the pan begins to smoke, it means that the pan is hot enough. Place the chicken in the pan. Cook the chicken for 4-5 minutes on each side until golden brown and the internal temperature reaches 165 degrees. Place the chicken breasts on a plate and allow to cool to room temperature while you make the dressing. To make the dressing, place the Greek yogurt, 2 tablespoons of olive oil, the juice from half the lime (reserving the remaining half), turmeric, dried coriander, dried ginger, cumin, cayenne pepper, 1/2 teaspoon sea salt and 1/2 teaspoon black pepper to a medium-sized mixing bowl. Mix to combine the ingredients and set the bowl aside until the chicken cools to room temperature. Once the chicken has cooled completely, add it to the yogurt mixture. Then add the red onion, celery, fresh ginger and sultanas. Stir to combine the ingredients and check for seasonings, adding more if necessary. Dispense the salad into 4 equal parts into colorful, bitter radicchio leaves or onto flour tortillas. Wrap and devour. * Greek yogurt is pretty thick, but I make it thicker by straining in a sieve covered in paper towel or cheesecloth for several hours.